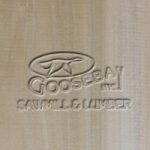 Yellow Poplar - Goosebay Sawmill and Lumber, Inc.
Yellow Poplar is also known as Tulip Poplar and Tulipwood. It grows in a wide distribution from New England southward to Florida and westward to Missouri. The sapwood is white and frequently wide. The heartwood is yellowish-brown and can be streaked with purple, green, black, blue, or red. The variation in coloration doesn’t affect poplar’s physical properties. It is moderately light in weight and moderately soft with a relative hardness of 540. Yellow Poplar has the reputation of being one of the easiest of all hardwoods to work with hand and machine tools. It works well in planing, turning, gluing and boring. It is average in mortising and in its ability to hold fasteners . It is poor in shaping and sanding. It holds stain and paint well. Poplar is often used in interior applications for mouldings , furniture, and millwork. Unlike pine, it does not have resins that could bleed through finishes. Also because it doesn’t have resins, it is not resistant to decay.